In Figure 1, the rows 1, 2, 4 and 8 have outline level value of 1. Rows 5, 6, and 7 have outline level 2. 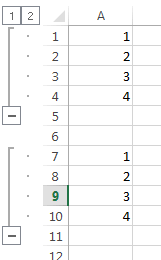 Rows 3 and 9 do not participate in the grouping and have the default value of 0. The maximum outline level is 7. The other option is to use the Group method exposed by the row/column selection classes. Figure 2 shows the result of both approaches. As with grouping, ungrouping can be done both through setting the outline level property of the row or column selection, or by using the Ungroup method exposed by the same classes. The following code snippets exemplify the two approaches to make these changes in a file. You can achieve the same result with the code in Example 4. When a selection of rows is grouped, the row immediately below them is automatically designated to be a summary row for this group. 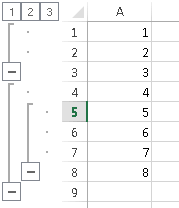 In the context of the grouping feature, this means that the plus/minus outline symbol will be aligned with this row. The same is applied to columns, whose summary column is automatically placed to the right of the group. In Figure 4, the summary row for the group of rows 1 to 4 is row 5 and for rows 7 to 10 it is row 11. Both properties have a default value of true. The following snippet shows how to set the value of the SummaryColumnIsToRight and what result to expect in the produced file.